Let your creativity loose! With a 50″ projection, getting everyone together means not having to crowd around a small screen. You can share your vision, or anything for that matter, on virtually any surface. 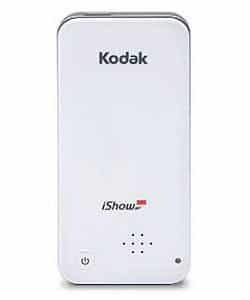 Kodak Pixpro iShow 1000 Get connected with HDMI or go cord-free with wireless integration for Android, iOS and Windows devices. Your portable big-screen easily adapts for any situation. Your creativity deserves a chance to shine. A generous 50 lumens will make sure everyone in the room gets a good look at every photo, movie and idea. Kodak Pixpro iShow 1000 Projections at the palm of your hand are now possible across multiple platforms. Use your Android, iOS or Windows device to project photos, videos, and documents. The iShow 1000 opens up the possibilities. Don’t let the show get cut short by a weak battery. With a full 90 minutes of battery life and a rechargeable lithium-ion battery, the iShow 1000 Projector packs plenty of life for your viewing pleasure.